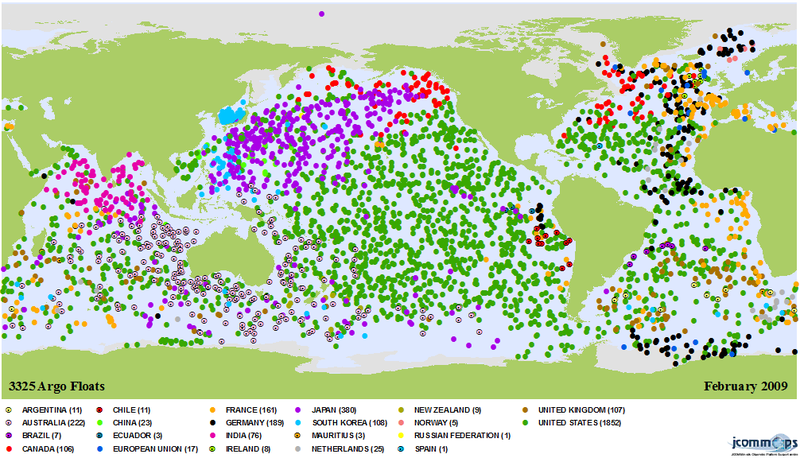 A global array of 3,000 profiling floats (Argo) has been proposed as a major contribution to the Global Ocean Observing System (GOOS) and the Global Climate Observing System (GCOS). Argo is an important international programme, endorsed by the World Meteorological Organization (WMO) and the Intergovernmental Oceanographic Commission (IOC), as it will provide significant benefits for seasonal forecasting, climate prediction and operational oceanography. Since its inception in 1999 over 20 nations have committed support towards building the Argo array, and a number of other countries have assisted in deploying floats. Deployment of Argo floats started in 2000 and expectations are that the array should approach the 3,000 float target by 2007. The present status of the array is shown in the figure below (produced by JCOMMOPS Argo Information Centre). Traditionally, temperature and salinity profiles have been provided by bathythermograph soundings from naval and merchant vessels, and sampling from research vessels. The bulk of the data is from merchant vessels taking part in the Ship of Opportunity Programme (SOOP), and is mainly confined to shipping lanes. The figure shows the locations of temperature profiles, received over the WMO Global Telecommunication System (GTS) during September 1999, as used in the Met Office's Forecasting Ocean Assimilation Model (FOAM). The float technology was demonstrated during WOCE (World Ocean Circulation Experiment) and shown to offer a viable alternative means of making ocean measurements at a lower overall cost. The expectation of Argo is to have approximately 3,000 profiling floats (giving a spacing of about 3° or 300 km) deployed globally. The figure (taken from the Argo brochure) illustrates the projected coverage of floats once Argo is fully established, illustrating the significant improvement in data coverage over that which is currently available. In particular, through air dropping, floats can be deployed in the remotest regions of the ocean. Argo floats drift at a parking depth of typically 1,000 m, descending to 2,000 m and then rising to the surface every 10 days to record a temperature and salinity profile and transmit these data back via satellite (currently using System ARGOS) before returning to their parking depth and continuing another cycle. A schematic of the mission cycle is shown in the figure (taken from the Argo Brochure). Argo floats are expected to be capable of making as many as 150 cycles, and operate for four years. Each Argo float (including its antenna) is typically 2 to 2¼ m long and up to 30 kg in weight. Currently there are two commercial float manufacturers: Webb Research Corporation and Martec. The Met Office is not responsible for the content of external articles.